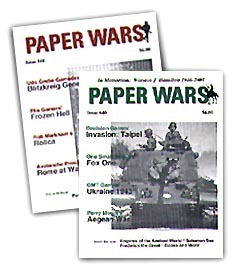 PAPER WARS is published bi-monthly by Omega Games. Issues are mailed after the first day of each of the following months: Jan, Mar, May, Jul, Sep, Nov. Payable by check, money order, or Visa/Mastercard to Omega Games. Contact the editors on all editorial matters. Contact Omega Games on all business matters such as advertising, subscriptions, etc. Please advise Omega Games of all changes of address immediately. Omega Games is not responsible for magazines not delivered due to incorrect addresses. Contact Bill Gibbs at (813) 661-3804 or omegagames@aol.com.